If you have any questions about the PEGASO information page below please contact us. This motor yacht PEGASO is a superyacht of sizeable proportions. 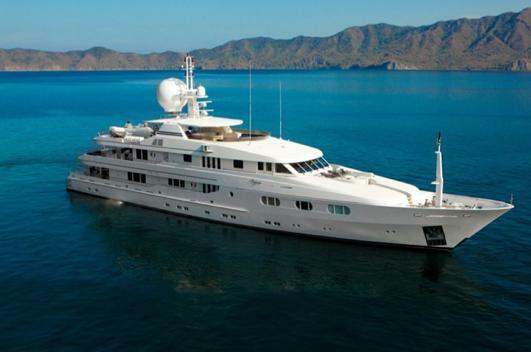 This 54 m (175 ft) luxury yacht was built by Proteksan Turquoise Yachts in 2001. PEGASO was formerly called the project or yacht name Only 4 You; Petara. Superyacht PEGASO is a beautiful yacht that is able to accommodate as many as 12 passengers on board and has a total of 12 crew members. 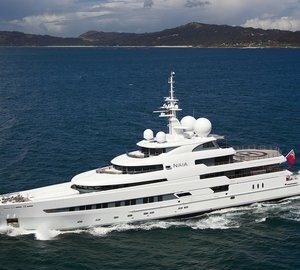 The firm of naval architecture responsible for this yacht's design in respect of this ship is Dubois Naval Architects and Donald Starkey Designs. Donald Starkey Designs / Celeste Del'anna was the designer which over saw the overall interior design. The yacht's general design work came from Dubois Naval Architects and Donald Starkey Designs. The professional naval architecture plans are the products of Dubois Naval Architects. Motor Yacht PEGASO received her elegant interior designing from the interior design firm of Donald Starkey Designs / Celeste Del'anna. Turkey is the country that Proteksan Turquoise Yachts completed their new build motor yacht in. After her formal launch in 2001 in Istanbul the boat was thereafter passed over to the happy owner having completed final finishing. Her core hull was built out of steel. The motor yacht superstructure component is fabricated largely using aluminium. With a beam of 9.35 m or 30.66 ft PEGASO has fairly large interior. A fairly deep draught of 3.25m (10.65ft) limits the amount of worldwide marinas she can berth in, taking into account their particular depth at low tide. This ship is powered by twin proven CATERPILLAR main engine(s) and can reach a impressive top end speed underway of around 16 knots. The main engine of the ship produces 1500 horse power (or 1987 kilowatts). Her total HP is 3000 HP and her total Kilowatts are 3974. Coupled to the PEGASO engines are twin screw propellers. Her industrious cruise speed is 12 knots which enables a range of 4500. Apportioning room for a maximum of 12 visiting passengers spending the night, the PEGASO accommodates them comfortably. This ship has room for around 12 professional crew to manage. 53.5 metres / 175.2 feet. 4500 at a speed of 11 knots. Saint-Jean-Cap-Ferrat. France. Département des Alpes-Maritimes. Provence-Alpes-Côte d'Azur. In October 2009 PEGASO went to Antibes, in France. This motor yacht also cruised the location encompassing Département des Alpes-Maritimes during October 2009. PEGASO features a teak deck. The luxury yacht PEGASO displayed on this page is merely informational and she is not necessarily available for yacht charter or for sale, nor is she represented or marketed in anyway by CharterWorld. This web page and the superyacht information contained herein is not contractual. All yacht specifications and informations are displayed in good faith but CharterWorld does not warrant or assume any legal liability or responsibility for the current accuracy, completeness, validity, or usefulness of any superyacht information and/or images displayed. All boat information is subject to change without prior notice and may not be current.